“Self-evident truths” was a profound concept used by the drafters of the American Declaration of Independence to insist on their rights and freedom from oppressive government. How did this Enlightenment notion of self-evident human rights come to be used in this historic document and what is its true meaning? 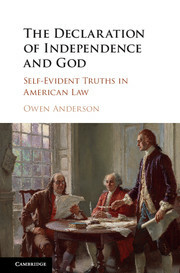 In The Declaration of Independence and God, Owen Anderson traces the concept of a self-evident creator through America's legal history. Starting from the Declaration of Independence, Anderson considers both challenges to belief in God from thinkers like Thomas Paine and American Darwinists, as well as modifications to the concept of God by theologians like Charles Finney and Paul Tillich. Combining history, philosophy, and law in a unique focus, this book opens exciting new avenues for the study of America's legal history. The multidisciplinary approach will be of use to students and scholars in law, philosophy, history and religious studies. Owen Anderson is also a contributor to the EPS website. Aikin on Evidentialism and the "Will to Believe"